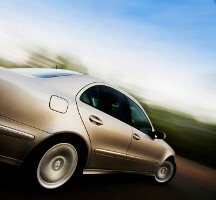 Your brakes are extremely important as you drive around Denver. Having good brakes just keeps you out of trouble. You’ll want to carefully maintain your brakes. With disc brakes, brake pads rub on a disc – or rotor – to slow the wheels. 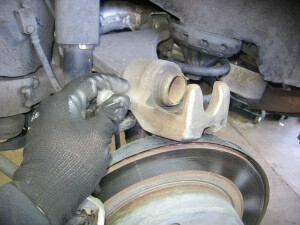 The brake pads are attached to a caliper that squeezes the pads against the rotor. It’s kind of like how squeezing the handbrake on a bicycle pushes the brake pads against the wheel of the bike. Now brake pads just wear away with use – like a pencil eraser wears out. The good news is that replacing brake pads is a straight-forward repair. If you hear squealing or grinding when you use the brakes, have your Express Car Care service adviser check them out. He’ll have a technician perform a thorough brake inspection to see what needs to be done. He’ll check for signs of brake problems and go over other brake components to see that they’re working properly. He can tell you if it’s time to replace the pads or if there are other issues with your brakes that should be addressed. Some people make the mistake of ignoring the warning signs and keep on driving long after the pads are completely worn out. When that happens, metal brake components will grind on the rotor, damaging it enough that it needs to be resurfaced or replaced. Taking care of your brakes keeps them working safely – and you could prevent premature brake repairs down the road. 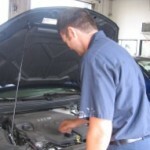 At Express Car Care in Denver, we install quality NAPA replacement parts. Hello Denver auto owners. Today, we’re talking about disc brakes. Your vehicle weighs several thousand pounds and it takes a lot of force to bring it and your passengers to a safe stop – so everything needs to be in good working order. The wheel hub keeps your wheel attached to the vehicle. The brake disc – or rotor – is attached to the hub and spins with the wheel as you drive. Your brake pads clamp onto the rotor to slow the wheel. The brake caliper straddles the rotor and squeezes the rotor to slow it down. The calipers contain brake pads which rub on the rotor when you step on the brakes. The brake piston causes the calipers to squeeze and release as you use your brakes. Your brake pads start to wear the first time you step on the brakes. Eventually the pads are worn out and need to be replaced. If you don’t replace brake pads when they’re worn out, the metal parts of the brake will grind against the rotor and carve grooves into the surface. If a scored rotor isn’t too bad, your friendly Denver technician can put the rotor on a lathe and smooth it out. If the grooves are too deep, or if the rotor is warped or cracked, you will need to replace it. At Express Car Care, we have been servicing disc brakes for Denver auto owners for years and we can help you. Servicing disc brakes at Express Car Care requires special attention to the mechanical sliding and mounting portions of the system. Your Express Car Care service supplier knows the special needs. Sometimes the brake pistons can stick and must be replaced. Typically it’s cheaper to replace the entire caliper at Denver auto repair centers than to rebuild the piston. So there you have it – a brief Express Car Care guide to how your disc brakes work. Denver auto owners who replace their brake pads on time will not only keep their vehicle stopping safely, but could save money on unnecessary brake repair down the road. Give us a call or come in and see us. During the winter months here in Denver, the weather is always changing and we never know just what conditions we will be driving in each day. That is why it is so important to keep brakes in good repair for winter driving. Existing brake problems can become worse during the winter, because we are driving in conditions that can cause traction to be reduced, like driving on snow and ice. Bringing your vehicle in for a brake inspection so you can be sure your brakes will perform correctly when you need them to and keep you and your passengers safe is an excellent idea during the winter months. 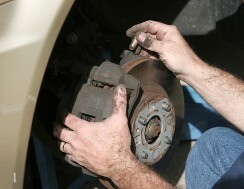 The easiest way to keep your brakes in good repair is to have them and the rest of your vehicle maintained regularly. It also helps to listen carefully to your car. Brakes will squeak, click or grind when there is a problem, it’s just a matter of listening and discovering when the noises change. As well as hearing squeaking or grinding noises when you apply the brakes, you might feel a pulse in your brake pedal, or a grabbing or pulling to one side or the other. These are all indications that it might be time to stop in and see your auto repair shop and have the brakes inspected. Having the brakes inspected goes a long way in preventing brake failure, but sometimes even with our best efforts, the brakes still fail. If this happens to you, here are a few things to remember. Don’t panic. By remaining calm you are more likely to be able to steer your vehicle to a safe stop. Turn on your turn signal and carefully try to get your vehicle to the right lane. Watch your mirrors to avoid hitting another car. When you reach the right lane, put on your hazard lights. This will let other drivers know that you are having a problem and allow them to steer away from your car. Take your foot off the gas pedal, downshift to a lower gear and allow the car to slow down. You can downshift even if you don’t have a manual transmission, move the shifter from “Drive” or “D” to “Low” or “L”. Steer your car onto the right shoulder of the road, and then shift your vehicle into neutral. Gradually apply the hand brake (emergency brake) until the vehicle comes to a stop. Pull the hand brake slowly to keep control over the vehicle. 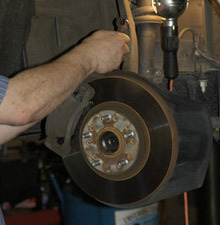 At Express Car Care we have been providing quality brake services in Denver for over ten years. So come in and see us or give us a call @ 303-691-2760. Every once in a while, new technology is introduced into the automotive world, meaning new concepts are added to the world of purchasing cars and maintaining them over a lifetime. Regenerative braking systems is one of those concepts. Regenerative braking was introduced when hybrid technology was introduced to the world of cars. 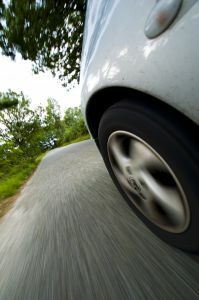 On a normal car, when you apply the brakes, the energy and heat of the action of braking dissipates and is wasted away. Not so with regenerative braking. Instead, when you apply the brakes, regenerative braking uses a mechanism that allows the vehicle to slow down while converting the resulting kinetic energy that is normally wasted into a useful form of energy. The energy and heat that is dissipated is instead converted and returned to the battery and reused in other systems throughout the vehicle. Because of this action, the battery is constantly being recharged, meaning the hybrid vehicle can go further on a charge without having to be returned to its outlet. The concept of regenerative braking is still new and confusing to many. Imagine your car and what happens to it once you apply the brakes. The brake pads slowly apply pressure, creating heat from the friction of the pads and the tires slowing down. Energy is accumulated as the brake pads wear against the rotors. This energy is transferred to the vehicles electric motor, charging the battery in the process. Regenerative braking does however have its limitations. Typically this system is only available on the wheels that drive the vehicle – so for a front wheel driven vehicle, it only applies to the two front wheels. This means your vehicle is only generating power on these two wheels. Because more action and power is associated with these wheels, they will have more wear and tear on both the wheels and tires, and on the brakes and brake pads. Which means you may be replacing tires, brakes and brake pads on a more frequent basis than those on the rear of the vehicle. Regenerative braking works best at greater speeds. The more friction needed to stop the vehicle, the more energy is created. So to get the most benefit from this system, a person should be more apt to driving at high speeds on an ongoing basis than slower, city driving. Have any questions about your regenerative braking system? Stop by or give us a call. We can make sure your car is in top condition, no matter how old or new, green or otherwise. One of the questions we hear in our shop is “how often do I need to change my automotive brakes?” If you are asking the same question, here are a few things to consider. It is very important to determine the condition of your brake pads. Brake pads typically come with a warranty, sometimes a lifetime warranty, but more commonly, it will be a warranty based on mileage, such as a 10,000 mile warranty. A lifetime warranty isn’t meant to last a car’s lifetime. Automotive part manufacturers use this terminology because brake pads do last a long time, but most car owners will trade in a car and purchase a new one long before their brake pads need to be replaced. Regardless of how you say it, it’s important to listen to your car instead. When you apply the brakes, you can hear the sounds of a worn brake pad. If you hear a grinding noise or a squeak, it is time to replace the brake pads, regardless of the mileage. The condition of the brake rotors also needs to be determined. Automotive brake rotors, or brake discs, are what your vehicle’s brake pads clamp down on and stop the wheels from spinning. 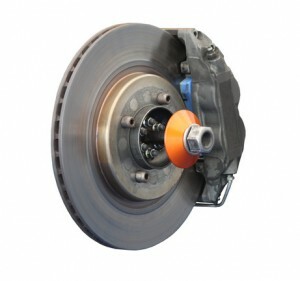 Similar to brake pads, there are different types of rotors. The type of rotor used depends on your car and your driving needs. Unlike brake pads, rotors do not need to be changed on a regular basis, and should last indefinitely, if you provide regular maintenance routines on your automobile. Rotors will be damaged if you allow your brake pads to wear down and drive without the use of pads for an extended period of time. The grinding noise you begin to hear from the brake pads is a sign that the screws in the base of the brake pads are grinding into the groove of your rotor. The longer you allow it to continue to grind, the greater your chance of having to replace your rotors. If you want to keep your automotive brakes in top condition, have them checked and replaced on a regular basis. For all of your Denver Auto Repair needs, trust Express Car Car. Come in and see us or give us a call at (303) 691-2760. Since as a rule, we don’t normally think about the brakes on our cars until they don’t work, we thought we would share with you five signs you need new brake pads. High- pitched squealing or screeching sound. If you hear a high-pitched squealing, this sound is coming from a small piece of metal called an indicator. The indicator rubs up against the brake rotor creating the squeal to alert you to the fact that you need new brake pads. If you hear this sound regularly you should have your car inspected as soon as possible. Your brakes can also squeal if your car has been exposed to water and then left sitting. This squealing should clear up after a few stops and isn’t anything serious. Pulling. If your car pulls to one side or another when you press the brake, that can be a sign that the brake pads are wearing unevenly and need to be replaced. Lack of Response. If your brakes don’t respond like they should when you step on the brake pedal or if the brake pedal feels soft, it might be a sign of a leak in the braking system. You could have an air leak in the brake hose or a brake fluid leak. If you see a small puddle under your car when it is parked, it could be leaking brake fluid and you should have a mechanic look it over. Grinding. This is one of the signs that the brake pads have very serious wear and are in danger of damaging the brake rotors. The grinding sound is caused by the disc and the caliper rubbing together. New brake pads sit between the disc and the caliper and keep them from rubbing together. When you allow your brake pads to wear down completely then they don’t “cushion” the metal parts as they should. Grabbing or vibrating. If your brake pedal grabs or vibrates, this is often a sign of warped rotors, but it can also mean that your car is out of alignment. If it’s a sign of warped rotors, the grabbing or vibration happens when the anti-lock brakes aren’t engaged. Rotors can be warped by severe driving conditions where you are using your brakes for longs periods of time, like steep mountain driving or towing. This type of driving causes huge amounts of friction which heats up the rotors and causes them to warp. If you drive in these conditions, stop periodically and let the brakes cool off. As you can see, properly maintaining brake pads happens progressively. Be aware to the early signs of brake pad wear. It can save you time and money. The official start of summer is almost here and if you haven’t already gotten started on all those summer time activities, they will be starting very soon! So before you head out on the road and spend all those hours driving here and there in summer traffic. Now is the perfect time to take a few minutes and bring your car in for a brake system service. Our brakes are one of the most important parts of our cars and if something malfunctions in the brake system, we can be in real trouble. Proper maintenance and having the brake system inspected regularly can go a long way in preventing major problems from developing. We are usually carrying precious cargo with us as we drive and getting the proper brake system service will help us keep it safe! To learn more about our brake system service click on our link Service Brake System and then let us know how we can help you. The last thing we need in this fast-paced life we live in, is to have trouble ” putting on the brakes!” We can all benefit from slowing down and enjoying the ride every now and then. And just as we need to engage our “life brakes” we also need to be able to use the brakes on our vehicles. Sometimes this can be a challenge if our brakes haven’t been taken care of properly. If the brakes on your vehicle are not working properly, or if the brake pedal seems soft or spongy, it might be time you looked into having a brake system service. The brake system is the most important safety system on your car. The brake fluid used in your vehicle transmits pressure from the driver’s foot to the wheel cylinders, that pressure is then converted into a frictional braking force on the wheels. The frictional braking creates heat that can get transferred to the brake fluid itself. In order to operate properly, it is important that the brake fluid isn’t allowed to boil, even when this heat is created. To make sure it doesn’t boil, your brake fluid must be free of contaminants. Contaminants, including moisture can lead to early failure of brake components. Moisture absorbed by the brake fluid also causes the brakes to feel soft, spongy or to lose your brakes altogether. This is why we recommend a brake system service. Regularly changing the fluid in your brake system can improve the performance of the braking system and reduce the chance of costly repairs due to the failure of brake components because of fluid contamination. When we perform a brake system service, one of our technicians will remove all of the existing brake fluid in the master cylinder using a specialized brake fluid service system. This brake fluid service system is connected to all four wheels and will completely flush and refill the entire brake system and master cylinder. Give us a call at (303)691-2760 or come in and see us if you’re having a little trouble “putting on the brakes” or for any of your other auto repair needs. During the winter months when the weather is constantly changing here in Colorado and you never know for sure what the driving conditions will be for each day, it’s very important to stay current with our auto repair, especially when it comes to our brakes. Existing brake problems can become worse in the winter when we are driving in conditions that cause traction to be reduced. Bring your vehicle in and have the brakes inspected to make sure they will perform correctly and keep you safe while you are driving in winter weather. The simplest way to keep your brakes from failing is to have your vehicle regularly maintained. It’s also important to listen carefully to your car. Brakes will squeak, click or grind when there is a problem, its just a matter of listening and discovering when the noises change. Take note of any changes. As well as hearing squeaking or grinding noises when you apply the brakes, you might feel a pulse in your brake pedal, or a grabbing or pulling to one side or the other. These are all indications that it might be time to stop in at the auto repair shop and have the brakes checked out. Having your brakes inspected regularly is the best way to avoid brake failure. But sometimes despite our best efforts, something happens and the brakes fail! In case this happens to you, here are some tips that might help make the experience a little less frightening. Don’t panic. The calmer you remain, the more likely you will be able to steer your vehicle to a safe stop. Turn on your turn signal and carefully try to get your vehicle to the right lane. Watch your mirrors so you can avoid hitting another car. Take your foot off the gas pedal, downshift to a lower gear and allow the car to slow down. You can downshift even if your car doesn’t have a manual transmission, move the shifter from “Drive” or “D” to “Low” of “L”. Did you know that you should flush your brake fluid regularly? Most of us don’t know when to flush our brake fluid or why we need to do it. Brake fluid attracts moisture, and when moisture enters the brake fluid system, it creates some hazardous conditions. Moisture forms acid that attacks the rubber seals and keeps them from sealing properly. Moisture creates rust and corrosion that can become clogged in small passages and causes engine parts to seize. Moisture reduces the boiling point of brake fluid. When brake fluid boils it changes from a liquid to a gas, this prevents the brake fluid from doing its job correctly. It can only perform effectively if it remains a liquid. If your brake fluid boils, a vapor is created that reduces the amount of pressure that’s applied to the brake pads. If this happens, you can push the brake pedal all the way to the floor and still not be able to stop your vehicle. This moisture was not a huge issue ten years ago, but on ABS brake systems of today, the rust and debris that collects in the fluid can cause internal damage and be very costly. For more information on ABS systems check out our blog. So how do you know when to flush your brake fluid? Have your technician check the three C’s: color, clarity, and content. The color of your brake fluid should be a light amber. The clarity should be clear, which means it shouldn’t have any particles or debris in it. And the moisture content should be less than 3 percent. According to AAA, many cars on Colorado roads today, were built by European automakers and require regular brake fluid inspections, which about half the cars fail. Such inspections aren’t required here, but someone needs to monitor the color, clarity and moisture content of a vehicles brake fluid, either the owner or better yet, a professional! Brake fluid flushes are recommended every two years by industry standards, sooner if you live in a humid climate. 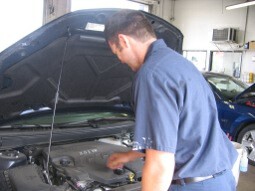 Check with your technician and discuss what works best for you and your vehicle.